GOG and Electronic Arts are giving away a pair of unlikely Ultima classics. When you think of Ultima, if you think anything in particular at all, it's probably about classic swords-and-sorcery role-playing in the land of Britannia, where the Avatar does his thing to bring peace, order and good government to all the peoples of the land. 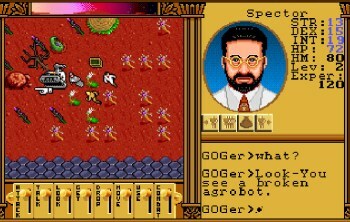 What you probably don't think about are dinosaurs and Mars, and yet both of those things are very much a part of the Avatar's experience thanks to the power of the Moonstone, which Origin put to creative use in the early 90s to broaden the scope of the game while retaining the famous Ultima brand. First up, in 1990, was Worlds of Ultima: The Savage Empire, which dropped the Avatar into the world of Eodon, a primitive land populated by dinosaurs and "stone-age tribes" threatened by a race of giant ants. A year later came Ultima: Worlds of Adventure 2: Martian Dreams, set in an alternate-universe 1893 in which many of history's greatest figures, including George Washington Carver, Thomas Edison, Marie Curie and Vladimir Lenin, are accidentally stranded on the surface of Mars and must be saved before the Earth's history is changed forever! It was a cheap attempt to cash in on the fame of the Ultima brand, yes, and the Ultima Worlds spin-off series was killed not long after the third game began production. But they are decent games in their own right, and now you - yes, you - can take them for a spin yourself, because GOG and EA are giving them away. And in fine GOG fashion, the games come with a whole bunch of extra stuff too, like maps, cluebooks, design documents and even some classic videogame music. And they're free! Did I mention that already? Either way, they are, so there's no reason not to check them out. GOG.com is where you want to go: Savage Empire here, and Martian Dreams there. You can tell 'em that Maly sent ya.